Jaina, A., Ratnawat, S., Chaturvedi, S. (2010). Rationalization of Physicochemical and Structural Requirement of Some Substituted 5-(Biphenyl-4-ylmethyl)Pyrazole as Angiotensin II Receptor Antagonist: A QSAR Approach. Iranian Journal of Pharmaceutical Sciences, 6(1), 51-58. Anurekha Jaina; Sumit Ratnawat; S.C. Chaturvedi. "Rationalization of Physicochemical and Structural Requirement of Some Substituted 5-(Biphenyl-4-ylmethyl)Pyrazole as Angiotensin II Receptor Antagonist: A QSAR Approach". 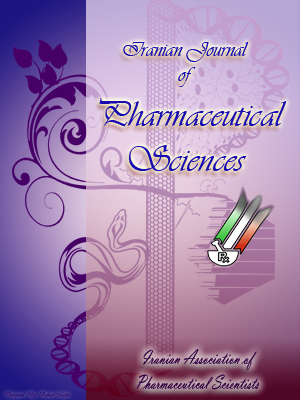 Iranian Journal of Pharmaceutical Sciences, 6, 1, 2010, 51-58. Jaina, A., Ratnawat, S., Chaturvedi, S. (2010). 'Rationalization of Physicochemical and Structural Requirement of Some Substituted 5-(Biphenyl-4-ylmethyl)Pyrazole as Angiotensin II Receptor Antagonist: A QSAR Approach', Iranian Journal of Pharmaceutical Sciences, 6(1), pp. 51-58. Jaina, A., Ratnawat, S., Chaturvedi, S. Rationalization of Physicochemical and Structural Requirement of Some Substituted 5-(Biphenyl-4-ylmethyl)Pyrazole as Angiotensin II Receptor Antagonist: A QSAR Approach. Iranian Journal of Pharmaceutical Sciences, 2010; 6(1): 51-58. A series of angiotensin II (A II) receptor antagonist of some substituted 5-(biphenyl-4-ylmethyl) pyrazole were subjected to QSAR analysis using Hansch and Fujita-Ban model, by using combination of thermodynamic, electronic, spatial descriptor and presence or absence of substituent respectively. Several QSAR model were obtained using stepwise regression analysis. Two models from both the method were selected on the basis of the statistical value that shows good significance with AII antagonistic activity. The best QSAR models further validated by leave one out cross validation method. The studies have help to ascertain the role of different substituent in explaining the observed antagonistic activity of this analogue. From Fujita-Ban model, it is predicted that butane and propane at position 1, COOH at position 4 are essential for activity. Group like CH2CF3 at position 1 and COOH in place of tetrazole at R3 position contribute negative to the biological activity. In Hansch model it is predicted that molar refractivity at the 1 and 3 position shows positive contribution to the biological activity. Field effect at position 4 also shows positives contribution to the biological activity. Hydrogen donar at position R3 and field effect at position 1 contributes negatively to the biological activity. The vasoactive hormone angiotensin II (AII) produced by the rennin-angiotensin system (RAS) is a potent regulator of blood pressure, homeostasis, fluid volume and electrolyte balance in mammals . The clinical success achieved by angiotensin converting enzyme (ACE) inhibitors in the treatment of the hypertension and congestive heart failure has made the RAS a major focus for the discovery of novel hypertensive agents. However, ACE also has kinase activity, and this lack of specificity has been implicated in the occasional side effect of ACE inhibitors such as dry cough and angiodema . With the development of A II receptor antagonist, a specific attempt to inhibit the activity of RAS has become the main pharmacological approach. Figure 1. A plot of observed vs. calculated angiotensin II antagonistic activity with residual presentation using Fuzita- ban QSAR model. There are at least two distinct AII receptor subtype, designated as AT1 and AT2 . The AT1 receptor is G-protein coupled and mediates most of the known physiological effect of AII, including the maintenance of blood pressure . The AT2 receptor is thought to be involved in fetal growth and adult tissue repair and remodeling, especially in cardiovascular system . Losartan, the most advanced nonpeptide AII antagonist, mediates its effect by blocking the AII AT1 receptor subtype . Due to our interest in various structural and new potential treatments for hypertensive disorders, we subjected a series of some substituted methyl pyrazole to QSAR analysis. QSAR is an important tool in drug designing technique [7, 8] to achieve different objective like diagnosis of mechanism of action of drug, quantitative prediction of biological activity of compound, classification of compound into various classes, optimization of lead compound and refinement of synthetic target. To achieve this target, various QSAR model have been used such as Hansch, Free-Wilson and Fujita-Ban model . To gain insight into the structural and molecular requirement influencing the AII antagonistic activity, we herein describe QSAR analysis of substituted pyrazole derivatives. A QSAR Model has been obtained for AII antagonistic activity. The relevance of the model for the design of novel derivatives should be assessed only in terms of predictivity, internal or external, but also in terms of their ability to provide a chemical and structural explanation of their binding interaction. Here, we propose general models from two methods for the antagonist and present minimal structural requirement for an AII antagonist. These results should serve as a guideline in design of more potent and selective AII antagonist. Figure 2. A plot of observed vs. calculated angiotensin II antagonistic activity with residual presentation using Hansch QSAR model. Table 1. Analogs of 5-(biphenyl-4- ylmethyl) pyrazoles and their biological activity. aConcentration of 50 percent antihypertensive activity data against against A II receptor; bNegative logarithm of IC50 activity data. Table 2. Substituent constants, calculated, and predicted value with residual and Z-score data analogs of 5-(biphenyl-4- ylmethyl) pyrazoles and their data used in Fuzita-ban analysis. The AII antagonistic activity data of 5-(Biphenyl-4-ylmethyl) pyrazoles analogs (Figure 1) were taken from the reported work of Carmen Almansa et al. . The antihyper-tensive activity data against AII receptor (IC50 in nm) was converted to negative logarithmic mole dose (-logIC50) in order to reduce the skewness of the data set, for quantitative structure activity relationship analysis (Table 1). Initially, series was subjected to Fujita-Ban analysis using regression technique in order to estimate the de novo contribution of substituents to the activity of the molecules. Further Hansch approach was carried out to established correlations between AII antagonistic activity and various substituents constants at position R1, R2, R3, R4 and R'of the molecule. Values of the substituents constants like hydrophobic (π), steric (Molar refractivity or MR), hydrogen acceptor (HA), hydrogen donor (HD) and electronic (field effect or F, resonance effect or R and Hammett's constant or σ), taken from the reported work of Hansch et al. were selected as independent variable and biological activity as dependant variable. Stepwise multiple regression analysis [12, 13] was performed to derive QSAR model and in addition to advance statistical validation procedure to select best QSAR model from high populated QSAR model by software Valstat . Resulting QSAR model assessed through a number of statistics obtained in conjunction with such calculation: Correlation coefficient (r), standard deviation (s), F-test, Bootstrapping (r2), Cross validation (Q2), chance statistics (evaluated as the ratio of the equivalent regression equations to the total number of randomized sets; a chance value of 0.001 corresponds to 0.1% chance of fortuitous correlation), outliers (on the basis of Z-score value) and leave one out method (Loo) was employed for cross validation of the best equation. Table 3. Substituent constants, calculated, and predicted value with residual and Z-score data analogs of 5-(biphenyl-4- ylmethyl) pyrazoles and their data used in Hansch analysis. Fujita-Ban analysis gave significant tri-variant regression expression (Equation 1) which account for more than 84% variance in activity with de novo contribution of substituents to the activity of the molecules. The equation showed moderate corelation coefficient value 0.84 with one outlier. The fitness of model can be improved by removing outlier, hence remaining 32 compounds were considered for the QSAR analysis. The optimized model showed equation have statistically significant corelation and significant for antagonistic activity. Fujita-Ban analysis (Table 2) of AII antagonistic data of 5-(Biphenyl-4-ylmethyl) pyrazole inferred that the 1st position of pyrazole ring is favorable for the butane, propane and the 4th position of ring is favorable for COOH group, respectively. Group like CH2CF3 at position 1and COOH in place of tetrazole at 2' position contribute negative to the biological activity. De novo contribution of groups also help in understanding of binding of molecule with AII receptor by means of possible hydrogen bond interaction in between COOH group at position 4 on the ring and polar positive charge region of AII receptor active site, second possible hydrophobic interaction of 1 position group of hydrocarbon and lipophillic pocket of AII receptor active site. This equation showed moderate correlation coefficient value 0.66 with one outlier (Comp. No. 18). The fitness of the model can be improved by removing outlier. Hence remaining 32 compounds were considered for the QSAR analysis of AII antagonistic activity. The optimized model gave statistically significant correlation for antagonistic activity. Only high correlation coefficient is not enough to select the equation as a model and hence various statistical approaches were used to confirm the robustness and practical applicability of equations. The equations 3 tested for presence of outliers one outlier was present suggested that although equation having good correlation coefficient but they are unable to explain the deviation of prediction of activity of a compound which involved in generation of expression. Equations 4 in randomize biological activity test showed probability of chance correlation were less than 0.1%. The equation was has better correlation coefficient (r=0.74), which accounts for more than 74.0% of the variance in the activity, the equation shows, that in multi-variant model, dependent variable can be predicted from a linear combination of the independent variables. The p value is less than 0.003 for each physiochemical parameters involved in model generation. The data showed overall internal statistical significance level better than 99.9% as it exceeded the tabulated F(4, 27)α 0.001=6.51 The model was further tested for outlier by Z-score method and one compound was found to be an outlier (Table 3) which suggested that the model is able to explain the structurally diverse analogs that is helpful in designing of more potent compounds using physiochemical parameters. Leave one out cross validation method was employed for prediction of the activity (Figure 1 & 2 and Table 3), cross-validated squared correlation co-efficient (Q2=0.710), predictive residual sum of square (SPRESS=0.426) and standard error of prediction (SDEP=0.376) suggested good internal consistency as well as predictive ability of the biological activity with low SDEP. Randomized biological activity test (Chance < 0.001) revealed that the results were not based on chance correlation. In general, the model fulfills the statistical validation criteria in a significant echelon to achieve theoretical base for proposing more active compounds which is helpful for rationalizing the interaction between molecule and receptor. Molar refractivity at the 1 and 3 positions shows positive contribution to the biological activity. Field effect at position 4 also shows positives contribution to the biological activity. Hydrogen donor at position 2' and field effect at position 2 contributes negatively to the biological activity. Authors are very thankful to the head, school of Pharmacy, DAVV, Indore for giving facility to complete the project. Ferrario CM. The renin-angiotensin system: Importance in physiology. J Cardiovasc Pharm 1990; 15: S1-5. Cockcroft JR, Sciberras DG, Goldberg MR, Ritter MJ. Comparision of angiotensin converting enzyme inhibition with angiotensin II receptor antagonism in the human forearm. J Cardiovasc Pharm 1993; 22: 579-84. De Gaspro M, Jhussain A, Alexander W, Cattr KJ, Chiu AT, Drew M, Good Freiend T, Harding JW, Inagani T, Timmermans PBMWM. Proposed update of angiotensin receptor nomenclature. hypertension 1995; 25: 924-39. Timmermans PBMWM, Benfield P, Chiu AT, Herblin BF, Wong PC, Smith RD. Am J Hypertension 1992; 5: 2215-355. Nahmias C, Strosberg AD. The angiotensin AT2 receptor: Searching for signal transduction pathway and physiological function. Trends Pharmacol Sci 1995; 16: 223-5. Carini DJ, Dunica JV, Aldrich PE, Chiu AT, Johnson AL, Pieerce ME, Price WA, Santella JB, Wells GJ, Wexler RR, Wong PC, Yoo S, Timmermans, PBMWM. Nonpeptide angiotensin II receptor antagonist: The discovery of series of n-(biphenylmethyl) imidazoles as potent, orally-active antihypertensives. J Med Chem 1991; 34: 2525-7. Tute M.S. History and objectives of quantitative drug design. In: Hansch C, (editor). Comprehensive medicinal chemistry. Vol 2, 4. New York: Pergamon Press, 1990. p. 579. Kubinyi H. In: Wolff ME, (editor), Berger's medicinal chemistry and drug discovery. 5th ed. Vol. 1. New York: John Wiley and Sons Inc., 1995; p. 91. Sarathy KP, Girdhar R, Yadav MR. QSAR study by Fujita- Ban model of some substituted α, β-diaryl five membered hetrocycles as Cox-1/ Cox-2 inhibitors. Indian Drugs 2003; 40: 9-18. Almansa C, Gomez LA, Cavalcanti FL, de Arriba AF, Rafanell JG, Forn J. Synthesis and structure-activitry relationship of a new series of potent AT1 selective angiotensin II receptor antagonists: 5-(Biphenyl-4-ylmethyl) pyrazoles. J Med Chem 1997; 40: 547-58. Hansch C, Leo A. Substituent constants for correlation analysis in chemistry and biology. New York: John Wiley and Sons, 1979; p. 114. Draper NR, Smith H. Applied regression analysis. New York: John Wiley and Sons, 1996; p. 193.
multiple parameter regression analysis applied to QSAR analysis. Indian J Pharm Sci 1998; 60: 371-4. Gupta AK, Arokia BM, Khakhedikar SG. Valstat: Valiation program for quantitative structure acyivity relationship studies. Indian J Pharm Sci 2004; 66: 396-402.